Don’t Book a Cruise Ship Excursion Before Reading This! If you plan on booking a shore excursion for your visit to St. Thomas, you have the option of either booking an excursion through the cruise line or through an online booking engine. The cruise ships have an extensive collection of tours you can book directly with them. This is a convenient way to plan your shore time in St. Thomas. There are also several booking engines that offer excellent tours. Triptelligent and Viator are a couple of the better ones. Some of the best cruise ship excursions on St. Thomas are listed below. St. Thomas isn’t generally known as an adventure destination but with the addition of a few new excursions, you can at least get a taste of a Caribbean adventure. Kayak Adventure Excursions-one of the newest and most heralded excursions in St. Thomas is also the most adventurous tour available. The tour takes you to the less developed west end of St. Thomas to kayak, snorkel and hike. This 3-4 tour also leads to the ruins of an old sugar mill. This is not an excursion the tour books know about. Zipline-heading into their 3rd year in St. Thomas, Tree Limin Extreme is one of the most popular tours available. An epic 2+ hour experience zipping through the tropical canopy high above the island, this is a tour to remember. Breathing Observation Submersible Scooter (BOSS)-Whether you are a scuba diver or not, you will find this a grand underwater adventure! Ride one of these scooter in the crystal clear waters of the Caribbean and get to see all the abundance of the ocean. 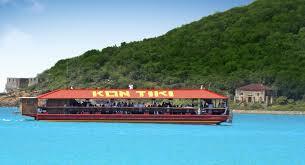 Kon-tiki-looking like a floating tiki bar, the Kon-Tiki is a party boat that offers fun for all ages. 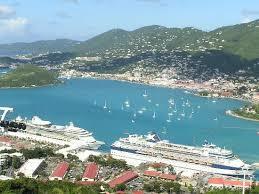 Enjoy this 3 1/2 hour excursion that starts and ends in beautiful Charlotte Amalie Harbor. A stop at a quiet and idyllic beach for music, games and drinks is the highlight of this lovely boat excursion! New Horizons-head over to St. John’s unparalleled National Park aboard the 65 foot sloop. Sail the protected waters and see why the Virgin Islands offers some of the best sailing and snorkeling in the world. All-Inclusive Beach Day-walk off the ship and they take care of the rest. After being picked up at the cruise ship dock, you are taken to one of the most beautiful beaches in the Caribbean. The excursion includes all transportation, food, drinks, beach toys, kayaks, snorkel gear and more! Great for families, groups or just the two of you. Coral World-Coral World is a marine park loaded with animals from the Caribbean sea. Aquariums are abundant, there is an underwater observatory and there are petting pools with stingrays, lobster and star fish. You can also swim with turtles, sea lions and sharks for an additional charge. Waterfront Fishing-right on the waterfront in downtown Charlotte Amalie is some great fishing. Fish for a few hours as part of your downtown shopping/sightseeing trip. Anglers of all ages are welcome. Paradise Point Tramway-a ski lift takes you up the side of a small mountain earning you some of the best views of the harbor. At the top of the tramway are restaurants, shops and other amusements. When your cruise ship arrives in St. Thomas you have many options for exploring the island. St. Thomas is most widely know for its shopping. But if you need a break from the stores, any one of these excursions or tours will make your stay in St. Thomas unforgettable.